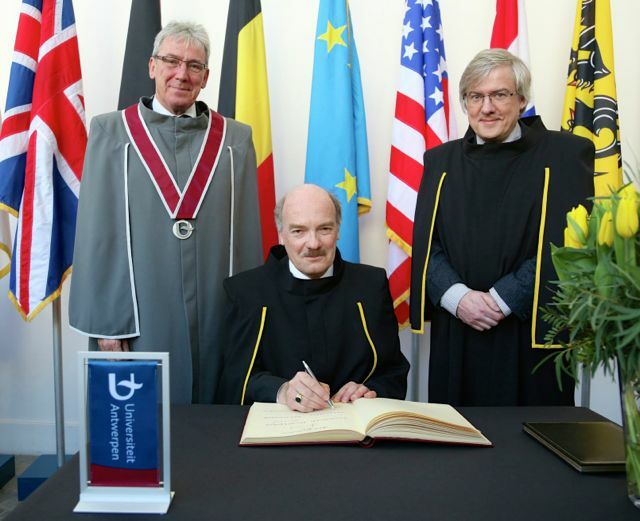 Associate Research Professor Eduard Hovy earned an honorary doctorate from the University of Antwerp last month. In discussing Hovy's nomination, University of Antwerp Professor Walter Daelemans praised the far-reaching nature of Hovy's work — which impacts everything from cancer research and treatment to protecting social media users from cyberbullying. "I especially admire Ed Hovy, because in spite of the status he now has in the field, he remains accessible," Daelemans said. "He is a very pleasant man, willing to support all international initiatives related to computer linguistics. That, and the fact that scientifically he is an important man in this field, is also one of the reasons why we proposed him for an honorary degree." As part of his appointment, Hovy delivered a master class at the University of Antwerp titled "Natural Language Processing and Its Impact on Personal Privacy." Read more about Hovy's honor on the University of Antwerp's honorary degrees page. You can also watch a video about Hovy's nomination.